Joi Barrios has had a varied career in higher education including tenure track and administrative positions. 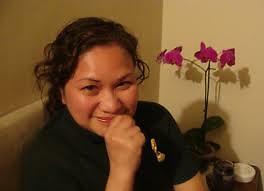 She’s currently a lecturer of Filipino/Tagalog and Philippine Literature at UCB. She’s also the Local President of UC-AFT 1474 at Berkeley. In our interview with Joi, you can read more about her current writing projects, her views on teaching language and literature, and the work she’s doing as the leader of the UC-AFT local at UCB. Q: AFSCME and UAW had one-day strike on November 20 and you spoke at one of the rallies at Berkeley. What was that experience like for you and why did you think it was important for UC-AFT to participate? I thought it was important that we express our solidarity with AFSCME because we belong to one campus, we work alongside each other, and we need to support each other. I wanted to speak to share with AFSCME members that we had specifically asked our members to support the strike by reading a statement to their classes, respecting and joining the picket line, etc., and that like them, we believe in the dignity of labor and that workers' rights are human rights. In my youth, I was a street theater performer for many years during Martial Law (1972-1986) in the Philippines. 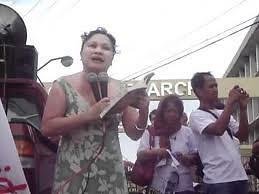 Before going to the US (to be with my husband -- a Canadian), I often read poetry in rallies. But I never really gave speeches back in Manila. However, I thought it was really important for me to speak -- first, as president of the lecturers' local union, and second, as a person of color -- many of the service workers and health workers, are after all, people of color. Q: You are the current President of UC-AFT Local 1474 at Berkeley. As a pre-sixth year lecturer, why is important for you to get involved at this level with UC-AFT? J.B. I believe that because pre-six are more vulnerable, it is more important for us to be involved. Even when we have relatively good individual circumstances in our departments, lecturers are still marginalized within the university. This isn't right, and I believe that collectively we can begin to improve this. We owe a lot to the Lecturers who stepped up to the challenge of forming a union many years back, and gained for present members what we enjoy today. However, we need to safeguard our gains and continue to struggle for a better contract. If more lecturers are active, then we can bargain from a position of strength – I wanted to do my part. I have always been involved in academic unions and organizations. I was a founding member of the academic union at the University of the Philippines where I taught for more than 20 years before coming to Berkeley. Lecturers, tenured and tenure-track professors were in the same union. Before the establishment of the union, I was active with the Alliance of Concerned Teachers (ACT) in the Philippines. At the University of Michigan in Ann Arbor where I taught for a year, I was a member of the Lecturers' Employee Organization (LEO). Q: What kinds of issues is Local 1474 working on at the moment? J.B. We are working on enfranchisement and membership campaigns. Lecturers need to have a stronger voice in the university. Recently, we've put out announcements urging members to be involved in local union committees, hoping that more members can volunteer and be more active in union work. I am hoping that our enfranchisement campaign, called UC (See) Democracy?, will give our members a platform to work on issues that are most important to them…issues that affect morale, satisfaction and happiness with work. We’re also involved in bargaining a first contract for the UC Hastings Librarians. It’s been great to bring union representation to our colleagues at Hastings. Q: You teach Philippine Literature in addition to teaching Tagalog. What aspects of teaching these two types of courses do you find most rewarding and challenging? J.B. With Philippine Literature, it’s being able to teach the history of the Philippines through literature -- being able to share how literature not only articulated the struggles of the Filipino people but also actively participated in the shaping of history. With language teaching, its developing new materials -- my students and I recently finished developing videos and PowerPoints that can be used for teaching the language in virtual classrooms. The language is not taught in all UC campuses and only Berkeley offers advanced Filipino. My dream is for all UC students to have the opportunity to learn the language in all levels. Q: Tell us about your research interests and writing? Do you have any projects in the works? J.B. I am currently doing research on Tagalog women writers in the 1930s during the American colonial period in the Philippines, working on my fourth poetry book and revising my Filipino language musical play "Piketlayn Cantata." My intermediate Tagalog/Filipino book and a Tagalog/Filipino-English dictionary (coedited) are coming out in 2014 (both by Tuttle publishing), so while I was finishing these two books in 2012-2013, all my research and creative projects were on hold. Q: You've been doing relief work for victims of typhoon Haiyan, which hit the Philippines a few weeks ago. What organization are you working with, and what type of work are you doing? J.B. I am working with NAFCON (National Alliance for Filipino Concerns) as one of the Bay area spokespersons for the Taskforce Haiyan campaign. On campus, I work with the two other Filipino language teachers and the 7 Filipino student organizations -- the students made and sold ribbons, we had a 15-minute silence to honor the victims (Wednesday, Nov 20) and a candle lighting program (Thursday, Nov 21). All proceeds on campus will go to NAFCON, which in turn, goes to Balsa, an alliance of people's organizations whose volunteers are now distributing relief goods in areas not yet reached by government agencies and providing medical assistance. The situation with the typhoon is very difficult. My family's own homes in Aklan, Panay island were damaged by the typhoon, so I was extremely touched that during the 15 minutes of silence, the AFSCME workers and the GSIs stood under the rain with the Filipino students and myself, as we unfurled the Filipino flag the students had made.